This is the story of the Amalgamated Society of Railway Servants, which later became the National Union of Railwaymen and later still the RMT. Work on the mid-nineteenth century railways was hard and dangerous. Accidents claimed the lives of hundreds of railwaymen every year, and one parliamentary inquiry revealed that employees could work 90 to 100 hours a week, with obvious implications for their health and safety and that of their passengers. Even so, the work was both secure and prestigious, and the rail companies were experienced at dealing with attempts by their workers to organise. When guards working for the Great Western Railway formed a Railway Working Men’s Provident Association in 1865, the company moved swiftly to disrupt it by dismissing its more prominent members. Editors of Railway Review. Top, l-r: William Bell, Scotia of Railway Review; Edw Phillips, Ed. Railway Gazette. Middle: W. Foreman, James Greenwood, F. Maddison. Bottom: G.J. Wardle, Willet Ball 1917-22. It was not until 1871 that the first enduring trade union organisation emerged – the Amalgamated Society of Railway Servants of England, Ireland , Scotland and Wales (ASRS). Within a year, it claimed 17,247 members, but this represented a tiny proportion of the 250,000 who worked on the railways, and internal disputes weakened the new organisation, so that by 1882 membership had fallen back to 6,300. The union claimed to represent all types of railway workers. In practice, it did not recruit general labourers or the craftsmen working in the engineering shops. However, its view that the skilled drivers and firemen should be in the same union as station and other workers was not shared by the footplatemen, who would later form the Associated Society of Locomotive Engineers and Firemen (ASLEF) – which has resisted all attempts to entice it into merger to this day. The ASRS played an important role in the emergence of the Labour Party. In 1901, the House of Lords upheld the Taff Vale judgement, making it possible for unions to be sued for the actions of their members – effectively making industrial action impossible, and providing an important impetus to the cause of independent representation for working people in Parliament. The union had been one of the founders of the Labour Representation Committee in 1900 – but in 1910 was again taken to court as the result of a political challenge, when the Osborne Judgement made it illegal to use union funds in support of parliamentary representation. In 1913, the ASRS merged with the General Railway Workers Union and the United Pointsmen and Signalmen’s Society to form the National Union of Railwaymen, with a combined membership of 267,000. Membership of the NUR peaked in 1947 at 462,205, but later declined as the railway system contracted. The NUR later merged with the National Union of Seamen to form the National Union of Rail, Maritime and Transport Workers (RMT). In 2004, the union was expelled from the Labour Party after some branches supported rival candidates. The lists below name all those who served on the national executives of the ASRS and NUR up to the 1920s. They are taken from Fifty Years of Railway Trade Unionism , by GW Alcock (Co-operative Printing Society Ltd 1922), as are the pictures on this page. Historical Directory of Trade Unions, vol 3 , Arthur Marsh and Victoria Ryan (Gower, 1987). Fifty Years of Railway Trade Unionism , by G W Alcock (Co-operative Printing Society Ltd, 1922). Associated Society of Locomotive Engineers and Firemen (ASLEF). 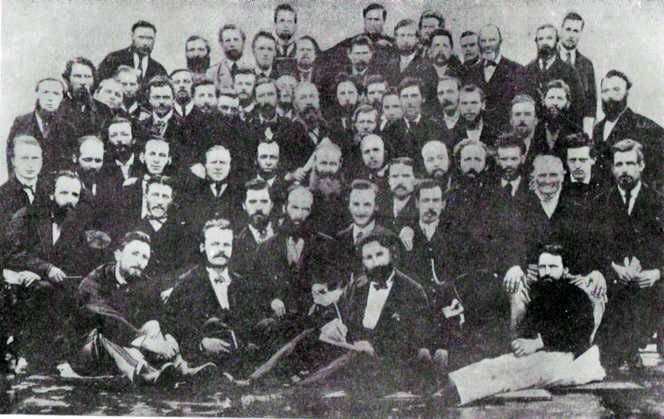 Delegates to the first conference of the Amalgmated Society of Railway Servants in 1872. Like other unions, the ASRS placed its early management in the hands of a single locality – in this case, London. The list is taken from those supplied to the Registrar of Friendly Societies. 1874. Names are not given, but districts are, and a few names can be rescued, most of which figure in 1875. The districts are: Leeds, Liverpool, Manchester , Sheffield, Boston , Birmingham , South Wales, Bristol , North London (two), South London (one). 1875. Brett, Liverpool ; P. Bannister. Boston ; E. Harford, Sheffield; J. Cordwell, Manchester; C. Vincent, Birmingham ; S. Wyatt, South Wales; J. Watts, Bristol; G. Boon, North London; Laceby, North London; S. Cook, South London; R. Whitmore, South London; Malcolm, Leeds. 1876. J. Graham, G. Boon, No. 1 London District; S. Wyatt, W. Vile, No. 2 District West of England and South Wales ; J. Hague, A. Holland, No.3 Nottingham District; C. B. Vincent, G. Waine, No.4 Welsh and Central District; J. Cordwell, J. M.Rowlands, No. 5 Manchester District; T. P. Ma1colm,T. Holmes, No. 6 North-East District. 1877. The Districts remain the same: G. Boon, F. Hornsby, S. Wyatt, M. Wheeler. J. Hague, T. Hewitt, W. Thornton, C. Crossley, J. Cordwell, J. M. Rowlands. T. P. Malcolm. W. D. Berry, R. Hollis, H. Jackson, J. Jones, W. Riley. 1878, J. Cordwell, Ardwick; C. Crossley, Birmingham ; T. H. Haines, Stratford ; J. Pilcher, Clapham Junction; S. Wyatt, Bristol ; E. Harford, Sheffield ; J. Tones, Edge Hill; J. Lace, Cardiff ; W. Robins, Camden ; F. Hornsby, Twickenham; J. Hague, Nottingham; W. Bell , Edinburgh ; W. King, R. Hollis, Staveley; W. Hoyes, Doncaster; M. Wheeler, Gloucester ; T. Chapman, Northampton. 1879. G. Boon, Camden ; F. Hornsby, Twickenham; M. Wheller, Gloucester ; J. Harris, Salford No. 2; T. H. Haines, Stratford; R. Hollis, Staveley; E. Harford, Sheffield; S. Wyatt, Aberdare; F. Willis, Openshaw; J. Flintham, Leeds, vice Price (resigned); J. Jones, Edge Hill, vice W. Bell (resigned); G. Hill, vice Mr. Chapman (resigned); W. Vile, Newport , vice Mr. Blake (resigned). The reason of these resignations is not hard to see. Evans had bid for a fighting union. 1881. G. Compton, Bow; G. Watson, Preston; J. Pilcher, Clapham Junction; F. Whitehouse, Leeds; J. Jones, Edge Hill. The records do not show where the others came from, but the “Railway Review” gives the district without the names. And the E.C. minutes the names without the districts. They are Camden , Exeter, Willesden, Birmingham , Miles Platting, Normanton, Accrington, Nuneaton . The only other names on the E.C. minutes, which are the only ones not printed in our 50 years, are B. Pipe, W. Palethorpe, W. H. Trinder, H. Dickinson, E. Barnes.,W. C. Herbert. 1882-3. J. Whitehouse, Leeds; G. Compton, Bow; G. Langlands, Gateshead; G. Watson,. Preston ; W. H. Trinder; F. Hornsby, Twickenham; T. Watson, Darlington; W. C. Herbert; J. Abbott, Wigston; C. Craig; J. Millington; W. Foreman, Sunderland; T. Noblett, Kentish Town ; J. H. Stantial, T. Newman,, W Palethorpe. The district omissions apply here as in 1881, and are Nuneaton, Nine Elms, Cardiff , Birmingham , Doncaster . 1884. G. Compton, Bow; J. Higginbottom, Bristol ; A. W. Thomas, Bath; W. Hoyes, Doncaster; T. Raines, Newport ; T. Parry, Cardiff ; W. Sabin, Birmingham; W. Bell , Edinburgh; W. Foreman, Sunderland; T. Moore, Nine Elms; T. Rutter, Willesden; G. Watson, Preston; J. Appleton, Leeds. 1887. W. Ellis, Battersea; J. Hepburn, Child’s Hill; G. Williams, Willesden; G. W. Williamson, Colwick; W. McRobertson, Hasland; W. Mickelwright, Wolverhampton; W. Sparks, Gateshead ; W. Keel, Middlesbro’; E. Garrity, Accrington; F. Willis, Openshaw; G. Thaxton, Leeds ; R. Workman, Abergavenny; H. Davis, Newport ; G. Wright, Leicester, in place of Williamson (resigned); S. Arnold , Birmingham , in place of Mickelwright (resigned). 1888. A. W. Thomas, Bath ; G. Thaxton, Leeds; W. Mawby, Nottingham; T. H. Reeves, Aberdare; J. R. Wharxton. Newcastle ; G. Williams, Willesden; G. Noble, Wigan ; A. Gill, Brighton; W. Hulme, Altrincham; H. Lawrence, Stratford ; W. Keel, Middlesbro’; J. Dobson, Barnsley; R. Foulkes, Shrewsbury ; J. Slack, Buxton, in place of Mawby (resigned). 1889. J. R. Wharton, Newcastle No. 1; J. Newlands, Sunderland; A. McLaren, Liverpool No. 1; J. Appleton, Leeds ; J. F. Grove, Keighley; T. Hewitt, Ton; J. Davidson, Wolverhampton No. 2; W. Reading , Paddington; W. H. Martin, King’s Lynn; J. Lace, Cardiff ; J. Williams, Pontypool; A. Gill, Brighton . 1890. G. A. Henderson, Shildon; J. Lace, Cardiff ; Tonge, Bolton; W. Reading , Paddington; J. Williams, Pontypool; H. J. Ronaghan, Stockport ; J. Hardy, Moira; W. Sabin, Birmingham ; J. J. Hornby, Newcastle ; W. Hudson, Darlington ; A. T. Welfare, Spa Road; W. Topley, King’s Cross; D. J. Cooper, Doncaster ; A. Fishlock, Wolverhampton . 1891. C. J. Bradshaw, Newport; D. J. Cooper, Doncaster; A. Fishlock, Wolverhampton ; G. Green, Leicester; W. Hudson, Darlington; J. J. Hornby, Newcastle ; G. A. Henderson, Shildon; A. McLaren, Liverpool No. 1 ; T. Parry, Aberdare; W. E. Perks, Ashton-under-Lyne; H. Scammel, Belfast ; J. Slavin, Dublin ; A. T. Welfare, Spa Road. 1892. W. Hudson (President), Darlington; R. Bell, Swansea ; J. Dickin, Wellington; T. Dickinson , Gateshead; W. Foot. West Brompton; M. Lyons, Manchester ; W. Lee, Hartlepool; M. Potter, Leeds No. 2; W. Payne, Canning Town ; J. Peters, Edge Hill; G. Shepherd, Toton No. 2 ; H. Scammel, Be1fast; I. P. Tevenan, Hull Central; A. W. Thomas, Bath . 1893. W. Hudson (President), Darlington; W. Foot, West Brompton ; G. Green, Leicester ; W. Riley, Mirfield; T. Taylor, Newton Heath; J. Bryant, Penarth; W. Payne, Canning Town ; W. Lee, Hartlepool; T. Dickinson, Gateshead ; J. Johnson, Bolton; R. Parr, Ferndale ; W. D. Dacey, Sheffield; D. C. Drinkwater, Wolverhampton No. 2 ; P. Burns, Amiens Street ; P. Tevenan, Hull No. 1 ; W. L. Davies. Machynlleth. 1894. W. Hudson (President), Darlington; E. H. Mitchell, Derby ; J. Morgan, Cardiff ; C. G. West, New Cross; J. Johnson, Bolton; W. D. Dacey, Sheffield; R. Lake , Newcastle ; T. Taylor, Newton Heath; W. Riley, Mirfield; W. Pearson, Armagh ; J. Cockerell, Stockton-on-Tees; J. Moir, Edinburgh; A. Terrill, Paddington; C. J. Bradshaw, Newport . 1895. W. Hudson (President), Darlington; E. H. Mitchell, Derby ; C. G. West, New Cross; J. Cockerell, Stockton-on-Tees; J. Moir, Edinburgh; W. Cornwall , Swinton; H. Doughty, Longsight; W. Rimmer, Wigan; G. Thaxton, Leeds ; J. Haynes, Walsall; T. Murphy, Dublin ; T. Peacock, Gateshead ; A. Terrill, Paddington; C. J. Bradshaw, Newport . 1896. W. Hudson (President), Darlington; J. Harvey, Belfast ; J. Miller, Parkhead; R. Lake, Newcastle ; T. Williamson, Middlesbro’ No. 2; W. Cornwall , Mexboro’ No. 1; T. London, Spa Road ; G. Thaxton. Leeds ; A. H. Savory, Willesden; G. Green, Leicester; N. Rimmer, Wigan; H. Doughty, Ardwick; W. Lewis, Cardiff ; R. Powell, Aberdare Junction. 1897. W. Hudson (President), Darlington; J. Slevin, Dublin ; E. Bancroft, Stockport No. 1; B. Kirkby, Batley; J. Ashton, Burton-on-Trent ; J. Miller, Parkhead; T. London, Spa Road; E. J. Perry, Stratford; T. R. Steels, Doncaster; J. Thornhill, Swansea ; T. Williamson, Middlesbro’ No. 2; R. Lake, Newcastle Trafalgar; J. Turton, Southport; J. Jones, Cardiff No. 1; G. Knight, Radcliffe. 1898. W. Hudson (President), Darlington; G. Thaxton (President), Leeds No. 2; D. Falconer, Motherwell; J. Cody, Dublin, Amien Street; A. G. Little, Newcastle Central; T. R. Steels, Doncaster; B. Kirkby, Batley; G. Knight, Radcliffe; J. Turton, Southport; J. Ashton, Burton-on-Trent; J. Thornhill, Swansea; W. H. Tugwell, Cardiff No. 3; E. J. Perry, Stratford; W. J. Tye, Battersea; W. G. Loraine, Hartlepool West. 1899. G. Thaxton (President), Leeds No. 2; J. Harvey, Belfast; D. Falconer, Motherwell; W. G. Loraine, Hartlepool West; J. W. Benson, Leeds No. 1; T. Topping, Mirfield; J. Holman, Accrington; M. Taylor, Stockport No. 2; E. H. Mitchell, Derby No. 1; G. Green, Leicester; J. Andrews, Child’s Hill; E. Lewis, Cardiff No. 2; J. Lenthall, Barry; W. J. Tye, Battersea. 1900. G. Thaxton (President), Leeds No. 2; J. Andrews, Child’s Hill; A. Moss, New Cross; J. Holman, Accrington; M. Taylor, Stockport No. 2; W. Bancroft, Neepsend; C. A. Beck, Small Heath; H. C. Parkinson, Peterborough No. 1; J. Guthrie, Glasgow A; J. Fitzgerald, Kingsbridge ; W. Mowforth, Hull Central; M. Cheeseman, Newcastle City; J. Taylor, Cardiff No. 1; T. Topping, Mirfield; J. W. Benson, Leeds No. 1. 1901. G. Thaxton (President), Leeds No. 2; A. Moss, New Cross; J. H. Palin, Laisterdyke; H. C. Parkinson, Peterborough; J. Guthrie, Glasgow A; J. Phipps, Ormskirk; M. Jones, Pontypridd; A. H. Lusty, Poplar; W. Bancroft, Neepsend; C. A. Beck, Small Heath; T. Murphy, Kingsbridge; J. Brodie, Percy Main; C. W. George, Liverpool No. 3; C. Gray, Hull No. 6. 1902. W. G. Loraine (President); J. Brodie, Percy Main; S. Bartlett, Nottingham; S. Dowie, Edinburgh; C. W. George, Liverpool; Charles Gray. Hull; J. Holman, Wellingboro’; M. Holohan, Dublin; T. J. Hart, Cardiff; A. Lusty, Poplar; E. H. Mitchell, Derby; J. H. Palin, Bradford; J. Phipps, Ormskirk; W. G. Smith, Spa Road. 1903. W. G. Loraine (President); E. H. Mitchell, Derby No. 1; W. G. Smith, Spa Road; J. Millington, Birmingham; J. H. Thomas, Swindon; Isaiah Evans, Cardiff No. 2 ; M. Davidson, Liverpool (Edgehill); R. Taylor, Leeds No. 1; W. H. Shaw, York (Central); W. E. Turner, Bury No. 1; S. Dowie, Edinburgh; J. Harvey, Belfast ; J. Holman, Wellingboro’; T. Dickenson, Gateshead; A.Allen, Middlesbrough (in lieu of W. H. Shaw [resigned]). 1904. 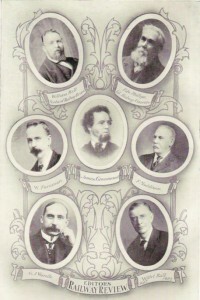 W. G. Loraine (President) ; T. Arnold, Manchester; G. Beadon, Cardiff; C. W. Beardsley, Sheffield; W. H. Barker, Hull; S. Bartlett, Nottingham; G. Burgneay, London; J. Cody, Dublin; T. Dickinson, Gateshead; J. Higgins. Glasgow; C. Loxstone, Derby; N. Rimmer, Wigan; R.Taylor, Leeds; J. H. Thomas, Swindon. 1905. J. H. Thomas (President), Swindon ; J. Cody, Amiens Street , Dublin ; J. Higgins, Polmadie; J. R. Bell, Newcastle City; E. Emblem, Hull No. 3; T. Topping, Mirfield; W. E. Turner, Bury No. 1; J. Thickett, Walsall No. 2; C. W. Beardsley, Grimesthorpe; S. Bartlett, Nottingham No. 1; W. R. Pountney, Kentish Town; W. Reynolds, Ashford; T. J. Robinson, Newport (Mon. ); T. Owen, Port Talbot . 1906. J. H. Thomas (President), Swindon ; J. Cody, Amiens Street , Dublin ; F. Swan, South Side, Glasgow; J. R. Bell, Newcastle City; C. A. Henderson, Tyne Dock; E. Emblem, Hull No. 3; T. Topping, Mirfield; W. E. Turner, Bury No. 1; N. Rimmer, Wigan; C. W. Beardsley, Grimesthorpe; S. Bartlett, Nottingham No. 1; J. Mayes, Peterborough No. 1; A. Harber, Deptford; T, J. Robinson, Newport (Mon. ); T. Owen, Port Talbot . Mr. Thomas having been elected Organising Secretary, J. R. Bell was elected President at the A.G.M. 1907. J. R. Bell (President), Newcastle City; T. Murphy, Kingsbridge; F. Swan, South Side, Glasgow; J. Brodie, Percy Main; E. Emblem, Hull No. 3; T. Topping, Mirfield; R. Bebbington, Miles Platting; N. Rimmer, Wigan; C. W. Beardsley. Grimesthorpe; W. Edwin, Rugby; J. Mayes, Peterborough; A. Harber, Deptford; T. J. Robinson, Newport; T. Owen, Port Talbot. 1908. J. R. Bell (President); T. Murphy, Kingsbridge; F. Swan; South Side, Glasgow; J. Brodie, Percy Main; W. Garton, Hull No. 6; G. Layton, Leeds No. 3; R. Bebbington, Miles Platting; N. Rimmer, Wigan ; W. Bancroft, Neepsend. W. Edwins, Rugby; J. Mayes, Peterborough ; A. Harber, Deptford; J. Mitchell, Paddington; E. Charles, Quaker’s Yard. 1909. J. R. Bell (President), Newcastle ; A. Bellamy (President), Stockport ; T. Murphy, Kingsbridge; A. J. Niven, Edinburgh; J. Brodie, Percy Main; W. Garton, Hull ; G. Layton , Leeds; R. Bebbington, Miles Platting; E. Edwards, Wolverhampton ; W. Bancroft, Neepsend; W. Edwins, Rugby; W. Carter, Kentish Town ; F. C. Fagg, Battersea; J. Mitchell, Paddington; E. Charles, Quaker’s Yard. 1910. E. Charles (President), Pontypool; B. Finnigan, Dublin ; A. J, Niven, Edinburgh C. A. Henderson, Tyne Dock; W. Garton, Hull; G. Layton, Leeds; A. Law, Manchester ; E. Edwards, Wolverhampton ; W. Bancroft, Neepsend; J. J. Towey, Birmingham ; W. Rimes, Peterborough ; F. C. Fagg, Battersea; J. Mitchell, Paddington; W. H. Tugwell, Cardiff . 1911. A. Bellamy (President). Stockport; B. Finnigan, Dublin ; A. J. Niven, Edinburgh ; C. A. Henderson, Tyne Dock; L. Hooton, Doncaster; C. T. Cramp, Sheffield A, Law, Manchester; E. Edwards, Wolverhampton; H. B. Preston, Hull ; J. J. Towey, Birmingham ; W. Rimes, Peterborough ; F. C. Fagg, Battersea; A Huckell, Neasden; E. T. Billett, Bath ; T. Robinson, Newport . 1912. A. Bellamy (President); A. G. Styler, Washington; G. Thaxton, Leeds No. 2; W. Tong, Llandovery; J. Walmsley, Fleetwood; F. Winfield, St. Pancras; S. Winship, Hull No. 1; E. Greenan, Belfast ; H. Brooks, Neasden; T. Swales, Northallerton; W. Todd, Gorton; C. Wightman, Hasland; J. Bailey, Southall; T. Collins, Leeds No. 2; J. Davies, Neath. 1913. A. Bellamy, J.P. (President); J. Allan, Edinburgh; E. T. Billett, Bath ; C. Bowtell, Ilford; J. Brand, Coatbridge ; G. Burgneay, Rotherhithe No. 1; W. Candler, West Hartlepool; A. H. Capewell, Darlington ; S. Cooper, Glasgow; C. T. Cramp, Heeley; J. M. Cuthbertson. Glasgow; W. Dobbie, York ; T. Dowling, County Durham ; H. Ellison, Preston; W. Fairless, Newcastle-on-Tyne ; W. Fitzgerald, Blackburn; C. J. Foddy, Warring ton ; R. A. Grantham, Bradford; W. Harrison , Manchester ; L. Hooton, Doncaster; A. Hurley, Birmingham ; S. Jones, Manchester ; E. Kelly, Leeds; J. Minns, Chester; C. Myers, Durham; H. B. Preston, Hull ; W. Pullinger, Catford; T. J. Robinson, Newport (Mon. ); W. Roome, Derby ; T. Shenfield, Newcastle-on-Tyne ; E. L. Storey, Manchester ; G. E. Stubbs, Manchester; E. Trippitt, Manchester;E. J.Vennell,Wood Green; J. Waterhouse, Brighton; F. A. Woodhouse, Hull . 1914. A. Bellamy, J.P. (President); J. C. Allen, Middlesbrough No. 2; C. W. Beardsley, Grimesthorpe; J, W. Bryan, Kentish Town No.1; W. Candler, West Hartlepool No. 1; E. Charles, Pontypool ; G. Clarke, Hull No. 3; G. Coleman, Spa Road ; C. T. Cramp, Heeley; J. M, Cuthbertson, Glasgow No. 9; W. Dobbie, York No.3; H. Ellison, Preston No. 1; C. Gilbert, Langley Mill; W. T. Griffiths, Newport No. 1; W. T. Hewitt, Workington; S. Jones, Manchester No. 8; R. McIntosh, Edinburgh No. 1; T. Norton, Nottingham No. 5; J. Patrick, Gateshead No. 1; T. Pocock, Battersea; W. H. Robinson, Birmingham No. 6; T. Rollo, Edinburgh No. 1; J. Stobie, Edinburgh No. 1; P. Thomas, Caerphilly; J. Waterhouse, Brighton No. 3; H. Williams, Liverpool No. 5. Districts Nos. 6 and 2 sat for three years, Nos. 5 and I for two years, Nos. 4 and 3, or one year. After that the elected one sat for three years. 1915. A. Bellamy, J. P. (President); C. W. Beardsley, Grimesthorpe; R. Bebbington, Miles Platting; C. T. Cramp, Heeley; H. Ellison, Preston; S. Jones, Manchester No. 8; T. Norton, Nottingham No. 4; W. Rooms, Derby No. 3; A. Whitehead, Newton Heath No. 2. 1916. A. Bellamy,J.P. (President); J. Allan, Thornton; H. J. Cook, Taunton ; H. Duddy, CarlIsle No. 2; J. FIrth, York; J. Marchbank, Glasgow No. 4; T. C. Morris Ystrad; E. W. Perry, Aberbeeg; P. Redmond, Dublin (North Wall); T. Skelcher, Birmingham No. 1. 1917. A. Bellamy, J .P. (President); E. Browning, Eastleigh (Hants); H. Charleton, Kentish Town No. 2; W. Fairless, Gateshead No. 2; C. A. Henderson, J.P., Tyne Dock No. 1; W. J. Hill, Paddington No. 2; G. Mason, King’s Cross No. 1; R. Robson, J.P., Hartlepool ; J. Wilson, Newcastle No. 2. 1918. C. T. Cramp (President); W. Bancroft, Sheffield ; C. J. Edwards, Garston; W. H. Farmer, Crewe No. 5; C. Harris, Colwick Junction; J. Jackson, Cambridge; A. Law, Newton Heath No. 1; A. Matthew, Chesterfield ; D. Ritson, Wigan No. 1. 1919. C. T. Cramp (President); E. G. Anderson, Bristol No. 1; A. J. Bayne, Dundee; W. Gordon, Edinburgh No. 1: W. T. Griffiths, Newport No. 4; P. Murphy, Cork No. 2; A. J. Niven, Edinburgh No. 1; C. J. Starling, Dudley; D. Thomas Caerphilly. 1920. W. J. Abraham (President); T. C. Allen, Middlesbro’ No. 2; P. H. Black, Covent Garden; W. L. Brunsden, Chalk Farm; W. H. Bunnett, Hull No. 3; W. Dobbie , York No. 3; W. T. A. Foot, Earl’s Court; T. Gore, Kentish Town No. 1; G. S. Palmer, Peterborough ; W. Race, Newcastle No. 3. C. Harris was appointed Organiser, March 27th and G. S. Palmer took his place. 1921. W. J. Abraham (President); D. Barnett, Keeley; C. Beamand, Manchester No. 12; C. W. Beardsley, Grimesthorpe; H. Ellison, Preston; J. Gillone, Manchester No. 15; J. Henderson, Carlisle No. 3; W. T. Jones, Lincoln No. 1; W. Rooms, Derby No. 3. 1922. J. Marchbank (President); J. M. Cuthbertson, Glasgow No.20; J. Kiddie, Glasgow No. 1; R. Holmes, Dublin (Kingsbridge); D. McGoire, Carfin; C. D. Watters, Briton Ferry; W. T. Montgomery, Coventry ; A. Wentworth, Swindon. The oldest (in service) employé of the Society is Albert Pilcher; the oldest officials P. Hewlett and G. W. Alcock. There is living only one ex-General Secretary, Mr. Richard Bell. November, 1871, to October, 1874. October, 1874, to February, 1883. February, 1883, to October, 1897. October 1897, to January, 1909. J. E. Williams, 1909 to 1916. J. H. Thomas, 1916 to 1922. W. Ellis, 1889 to 1892. T. Watson, 1873 to 1889. B. Lazenby, 1892 to 1922. C. Allsop, 1872 to 1874. H. J. Rivett, 1872 to 1874. Job Elliot, 1872 to 1874. C. Shrives, 1874 to 1876. F. Hornsby, 1874 to 1884. W. Robins, 1877 to 1889. E. Wimhurst, 1878 to 1889. J. Byrne, 1884 to 1888. J. Pilcher, 1888 to 1911. P. Hewlett, 1889 to 1922. F. C. Fagg, 1911 to 1922. After the first batch of Trustees, there were two only till Mr. Wimhurst was elected in 1878.